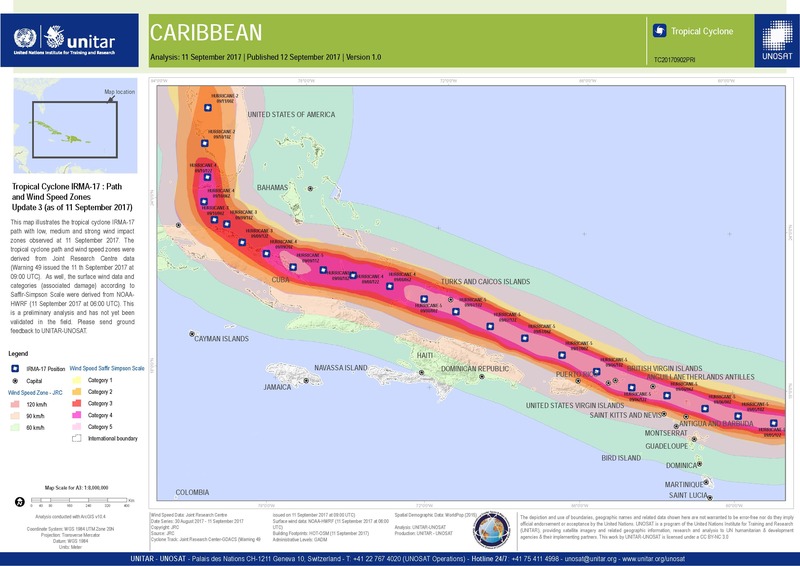 This map illustrates the tropical cyclone IRMA-17 path with low, medium and strong wind impact zones observed at 11 September 2017. The tropical cyclone path and wind speed zones were derived from Joint Research Centre data (Warning 49 issued the 11 th September 2017 at 09:00 UTC). As well, the surface wind data and categories (associated damage) according to Saffir-Simpson Scale were derived from NOAA-HWRF (11 September 2017 at 06:00 UTC). This is a preliminary analysis and has not yet been validated in the field. Please send ground feedback to UNITAR-UNOSAT.